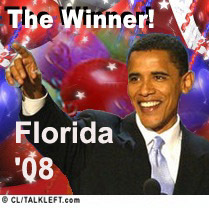 CBS calls Florida for Obama. ABC News has an analysis of the battleground states today. Eight states that could go either way -- Ohio, Florida, Virginia, Colorado, Nevada, Missouri, Indiana and North Carolina -- hold 111 of the 270 electoral votes needed for either candidate to win the presidency. Whether those red states will turn blue is yet to be determined, but according to the latest polls, Obama has a 52-45 percent advantage in those battlegrounds. States like Indiana, Missouri and North Carolina, previously leaning in McCain's favor, are now considered toss-ups. Bump and Update: I wrote the post below on Wednesday but am bumping it as Sen. Barack Obama has now released a new ad attacking McCain's proposed Medicare funding cuts. "John McCain's health care plan -- first we learned he's going to tax health care benefits to pay for part of it. Now the Wall Street Journal reports John McCain would pay for the rest of his health care plan 'with major reductions to Medicare and Medicaid.' $882 billion from Medicare alone. Requiring cuts in benefits, eligibility, or both. John McCain, taxing health benefits, cutting Medicare. We can't afford John McCain." Sen. Barack Obama has sent a letter to the DNC asking that the Florida and Michigan delegations be seated in full. As much as we knew this would happen, it still strikes a sore spot. The best article I've read on the Saturday debacle of the DNC's Rules and Bylaws Committee meeting in which it decided to seat Michigan and Florida delegates with 1/2 vote each and award delegates who voted for Hillary to Barack Obama, is Dana Milbank's in the Washington Post. It's a great read, you will feel like you were in the room witnessing the dissension, the childishness and the pettiness of all involved, from the committee members to Rep. Robert Wexler, and the resentment it caused among the spectators, which by now has spread across the party. Here's the gist of Lanny Davis' eminently fair proposal for seating Florida and Michigan delegates. In Michigan, Clinton received 55 percent of the vote. According to Thegreenpapers.com, she thus should receive 73 pledged delegates based on that percentage. What about the 50 remaining uncommitted delegates, and 7 collectively cast for Sen. Chris Dodd and Rep. Dennis J. Kucinich, who were also on the ballot? Some of those 50 delegates might have been for Clinton as a second choice to candidates other than Obama, so it would be totally unfair to award all 50 delegates to Obama....Obama was not forced by party rules to remove his name — he chose to do so. The Rules and Bylaws Committee of the DNC today announced how it will proceed at the May 31 hearing at the Marriott Wardman Park Hotel. It's open to the public, but you must pre-register. [T]he rules committee will meet at a Washington area hotel and consider two challenges – including one from Jon Ausman, a national committeeman from Florida. “A representative from each state party and from each presidential campaign will also have an opportunity to address the committee regarding each of the challenges,” the notice explains. The DNC Rulea and Bylaws Committee will meet May 31 to decide whether the DNC exceeded its authority in stripping FL and MI delegates because the states held early primaries. The plan under consideration: Allowing all the superdelegates to vote and giving the pledged delegates 1/2 vote (or only seating 1/2 the pledged delegates. Michigan lost 128 pledged delegates and 28 superdelegates, for a total of 156. Florida lost 185 pledged and 25 superdelegates, or a total of 210. Florida selected 27 delegates for the Democratic Convention today. Of the 27, three will go to the Convention not pledged to a candidate: Florida Chief Financial Officer Alex Sink, Senate Democratic Leader Steve Geller and House Democratic Leader Dan Gelber. The other 24 were allocated based on the statewide results from the January 29th Presidential Primary: 14 pledged to U.S. Sen. Hillary Clinton and 10 pledged to U.S. Sen. Barack Obama. In May, the delegation will be completed with 40 at-large delegates. In March, 121 delegates were elected at the Congressional District-Level. Florida has 23 unpledged delegates ("superdelegates") - 13 Members of the Democratic National Committee and 10 Democratic members of Congress. How Would You Resolve FL and MI? Assuming there will be no new primaries, how would you solve the problem with FL and MI? Yesterday, I asked what the difference was between the Credentials Committee and the Rules and Bylaws Committee and why the Clinton campaign in its response to Howard Dean's latest statement mentioned the Rules and Bylaws Committee when the media keeps talking about the Credentials Committee. Here's what's happening. Remember the Ausman challenge? Well, there are actually two Ausman challenges -- one regarding Florida's superdelegates, and one regarding the ability of the party's rules and bylaws committee to penalize an entire delegation. Howard Dean on CNN tonight: There are only 2 ways Michigan and Florida delegates will be seated. One is if Hillary and Obama agree on a plan. The other is after the nominee is chosen when she or he will control the credentials committee. In other words, Florida and Michigan are not getting seated in time to have a say in the nominee. If I were a voter in Florida or MIchigan, I'd be livid. The one thing neither Dean nor the DNC can control is whether the superdelegates consider the votes in Florida and Michigan. They can factor the votes into their own calculations of the popular vote. They can factor them into their decision as to which candidate is more electable in November. Florida and Michigan voters who want their vote counted ought to let the superdelegates from the other 48 states know. Here is a list of uncommitted superdelegates, and here is a list of committed superdelegates. Both should be contacted since superdelegates can decide or change their mind any time before they vote. Update (TL): Comments now closed. Bump and Update: Miami Herald: Poll shows 89% of those polled want their votes to count. A new St. Petersburg Times, Bay News 9 and Miami Herald poll finds one in four Florida Democrats may abandon the party if their Jan. 29 votes aren't counted. Howard Dean and Barack Obama may insist Florida’s Democratic presidential primary was meaningless, but a new poll shows Florida Democrats aren’t buying it, and one in four may not back their party's nominee in November if Florida winds up with no voice in the nomination. Twice as many Clinton supporters -- 56 percent -- want the Florida primary to count as do Obama supporters -- 27 percent. Still, even among Obama supporters, the idea of counting that primary is slightly more popular than holding a new election or dividing Florida’s delegates evenly between the two candidates. The AP reports that Hillary Clinton supports the proposed Michigan re-vote plan. Democrat Hillary Rodham Clinton Saturday said she supported a plan being developed by Michigan Democrats to hold a new primary in June. "I feel really strongly about it," Clinton said. "The 2.5 million people (in Michigan and Florida) who voted deserve to be counted. If it were my preference, we'd count their votes but if not, then they should have the opportunity to have a full-fledged primary waged for them and revote." Where's Obama on this? Hedging. Spokesman Tommy Vietor Saturday said the campaign was open to a "fair and practical" resolution of the conflict...."We will evaluate the details of any new proposed election carefully as well as any efforts to come to a fair seating of the delegates from Michigan." The head of Florida's Democratic Party said Thursday the proposed vote-by-mail presidential primary is unlikely to go forward because of strong opposition and concerns about conducting the vote. [Karen]Thurman will review comments from Democratic leaders and make a decision by Monday on whether to proceed with the re-vote. But she acknowledged that Obama has had concerns and the Democratic National Committee won't support a proposal unless both candidates also back it. She said there's a serious question over whether the state could legally verify the signatures of a privately run election. "If this becomes something that we can't do, then we can't do it," Thurman said. One added note: This is not an open thread. Comments not related to the revote and Florida primary will be deleted.